Commemorating the Freedmen's Colony of 1863 to 1867 on Roanoke Island, the marker is a polished black granite slab with a detailed pictorial engraving. The front face is engraved with the scene of an enslaved family, mother, elderly man, child, and dog, as they stand in a cleared field looking toward the rays of the sun as they shine through the clouds over a distant hill. A flag flies from a pole at the top of the hill as the rays of the sun reach it. The woman is shown on her knees with her hands outstretched toward the first light of freedom. The monument is inscribed on the rear face with historical information about the development of the colony during the Civil War and its ultimate abandonment following the war. 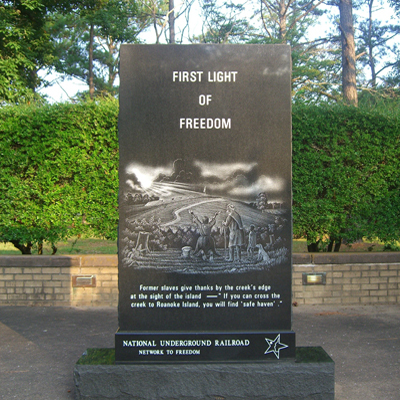 The memorial was erected to acknowledge the Freedmen's Colony as part of the North Carolina Civil War Heritage Trail and as part of the National Underground Railroad Network to Freedom. Rear: THE FREEDMEN'S COLONY / OF ROANOKE ISLAND / 1862–1867 / A year after the Civil War began, Roanoke Island fell / to Union Forces. Word spread throughout North Carolina / that slaves could find “safe haven” on the Island. By the / end of 1862, over a thousand runaway slaves, freed men, / women and children found sanctuary here. This colony, / precursor to the Freedmen's Bureau, was to serve as a / model for other colonies throughout the South. Once again / this small island, site of the first English attempt at / permanent settlement in the New World, became a land / of historic beginnings. / The Freedmen's Colony encompassed unoccupied, / unimproved lands from Manteo to the north and west / shores, including some of the land today known as / Fort Raleigh National Historic Site. A sawmill, hospital, / a school for black female teachers, and homes were / established. Able-bodied men were offered rations and / employment to build a new fort. They also enlisted to / form the First and Second North Carolina / Colored Regiments. The colony could not remain self-supporting / without men and became a refuge for three thousand / women, children, aged and infirmed. / Upon the war's end, the federal government / discontinued rations and supplies to colonists and returned / land to original owners. Reminiscent of early English / efforts, the Roanoke Island Freedmen's Colony was / abandoned by 1867. Many freed people remained, and / their descendants would become respected local residents. / Others settled in communities throughout the region and / would become an integral part of eastern North Carolina / culture. The monument was funded by a grant from the State of North Carolina to the Freedmen's Remembrance Committee. Roanoke Island descendents of colony members assisted in the 2001 dedication. The Freedmen's Colony of 1863-1867 was established on Roanoke Island by military order of the U.S. government which had taken possession of the island under the Union Army. The Freedmen's Colony was part of a larger effort by the federal government under the Freedmen's Bureau Bill enacted in 1865 during the Lincoln administration to assist slaves and refugees. The Bureau was dissolved shortly after during the Grant administration. While in existence, the colony served as a safe harbor for escaped slaves on the way to freedom as well as for free Blacks, and it became a model for the development of similar colonies in the South. The Union supplied the colony with provisions but ultimately abandoned the colony and support in 1867 following the war and returned land to original landowners. The inscription on the front face refers to the National Underground Railroad Network to Freedom. This program was created by the federal National Underground Railroad Network to Freedom Act in July 1998 to provide education, interpretive programs, and resources for preservation of history and sites that became part of the Underground Railroad and the slavery resistance effort. The monument stands outside the National Park Service's visitor center at Fort Raleigh Historic Site on the north end of Roanoke Island. The monument sits within the brick paving of the plaza, and the plaza is surrounded by a shady, wooded area. The National Park Service planned a ceremony for May 18, 2013 to commemorate the 150th anniversary of the founding of the colony. The event was scheduled to begin at the Dare County Old Swimming Hole Park on Airport Road in Manteo and proceed to the Fort Raleigh National Historic Site. The Old Swimming Hole Park is in close proximity to the property where the Freedmen's Colony was located on the island. Speakers were scheduled to include county officials, including Virginia Tillett, a descendent of the colony.